Heavy duty hedge scissor avail able in both wooden and pipe handle. Scissors Size : 17.5 cm. Net Quantity : 1 Nos. 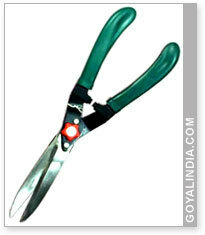 Our company has created a niche in the field of offering Gardening Scissor. We are offering Garden Scissor, Hedge Cutter Wooden Handle Hard chrome Item code GN 304, or plastic handle Item code GN 301, Flower Cutter etc. These tools are popular as they are easy to use and are cost-effective. PRUNING SECATEURS SHEARING TYPE IS A RIGHT TYPE OF SHEAR THAT CUTS SMALL TWIGS & BRANCHES WITHOUT DAMAGING THEIR GROWTH PROSPECTS. CUTTING WITH OTHER TYPE OF CUTTERS OR TWIST PULLS DAMAGES THEIR GROWTH. HENCE IMPAIRING & HURTING THE PLANT. They have been designed to ensure a smooth cutting action and comfortable use. We are offering an extensive collection of garden scissors. These products are so much demandable in wooden industries and easily available at reasonable rates. These scissors are so much useful in cutting of flowers in order to give attractive look to the flowers. We are providing a wide range of Labour Garden Scissor to our reputed clients at very reasonable rates.